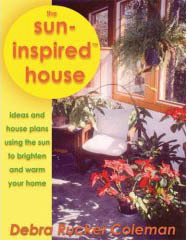 Nothing can be more comfortable for body and mind than living in a good solar-heated house. I say "good", because proper design is crucial to the comfort of such a house. 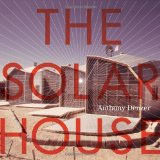 You may have gone into a solar house and felt stifled by the glaring heat, or perhaps you shivered from the lack of it. 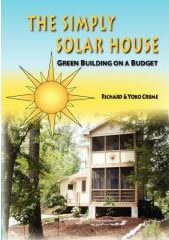 Good passive solar design will provide just enough sunlight into the rooms to be absorbed by the surrounding thermal mass (usually masonry materials), so that the heat will be given back into the room when the sun goes down. The thermal mass is a kind of "heat battery" that stores the warmth, absorbing it to keep the room from getting too hot during the day. Equally important to thermal mass is insulation (such as straw bales, crushed volcanic rock, or thermal shades) that will keep that heat inside. 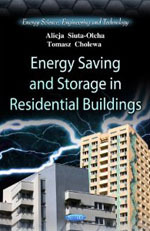 Thermal mass materials need to be insulated from the outside, or else they will just bleed that warmth right back out. 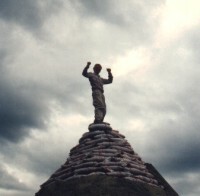 A rock house might have tons of mass, but be uncomfortably cold because of this energy bleed. So a good solar design will utilize materials of the right type in the right places, blending thermal dynamics with utilitarian design. 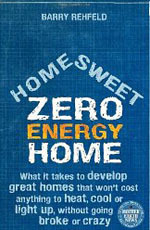 Many of the same principles that work to heat living space will also serve to keep that place cool in hotter weather. 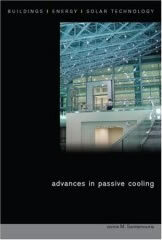 Other passive cooling strategies include wind towers that catch breezes and direct them through a house, and simple evaporative cooling concepts. 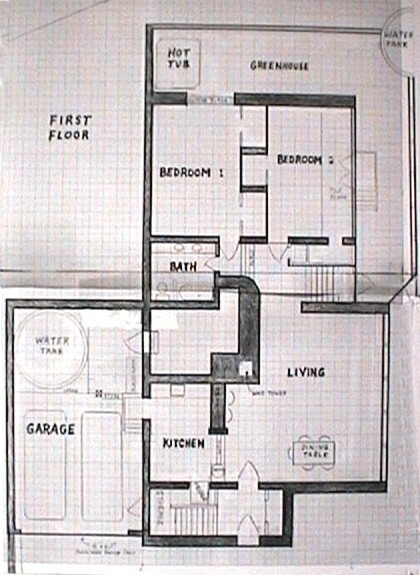 This is a 3 bedroom, 2 story, 3000 sf house, with attached garage. 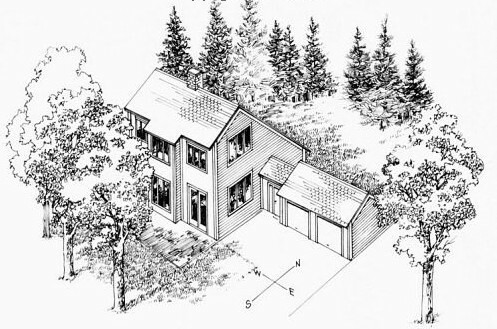 The design goals were to build a resource efficient, off-the-grid solar home, with no connected public utilities other than a phone line, and to use the home to generate performance data that would document how well the home's design and materials performed to keep the house cool in summer and warm in winter. 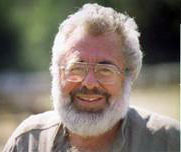 According to Paul Breaux, a physicist, Chez Soleil performs much better than he expected. 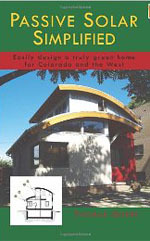 The home's temperature is comfortable year round, there is little home maintenance and operating expense, and the many people who tour the home can see and feel the benefits of "green" construction.Very little artificial lighting is needed during the day; natural light is plentiful on both the first and second floors due to window placement and open floor design. 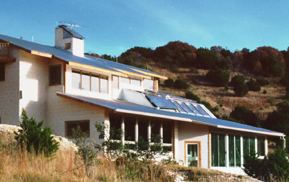 Chez Soleil has been written up in several publications including Environmental Design & Construction, the Austin American-Statesman, Southern Living, Mother Earth News, and Solar Today. 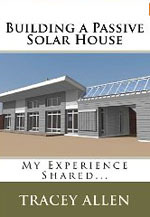 Chez Soleil was selected by the American Solar Energy Society for the society's solar home tours, and was featured at the 23rd National Passive Solar Conference. 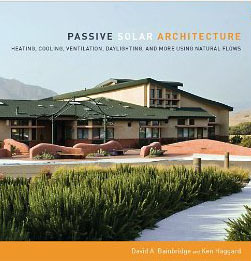 kahl.net/solarch shareware electronic primer on passive solar architecture. 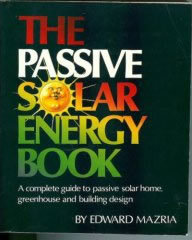 consumerenergycenter.com good overview of passive solar concepts. 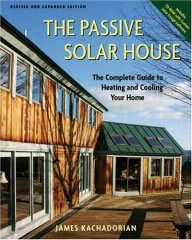 New Mexico Solar Energy Association description of passive solar concepts. 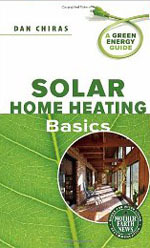 susdesign.com has some wonderful online tools for calculating proper window overhang design and heat gain for passive solar. susdesign.com free software to calculate sunangles from specified locations and times. 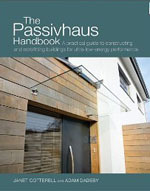 norishouse.com describes how a PAHS house can keep an underground house comfortable year round with no additional heat source. 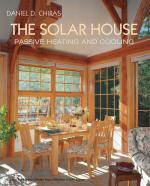 earthshelters has information and plans for a passive solar heat storage (PAHS) system and is related to the above link. 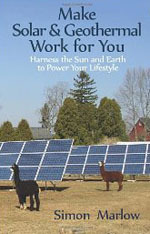 mobilehomerepair.com describes how to make a simple and inexpensive solar air heater. 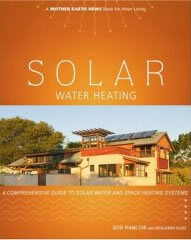 Seabird Island Project shows unique design for the solar heating of water and space through warm air collection and geothermal heat tubes. sailshadeyourhome.com simple Roman shades that are insulated with R-7 Reflectix. Instructions for how to make your own Roman Sailshade without the need to sew the fabric.